Linhart Dentistry has years of experience with out-of-town and International patients. From across the USA to countries around the world, Linhart Dentistry’s experienced team can make you comfortable, no matter how short your visit is to New York City! Our new Continental Suite (see photo insert), is specifically tailored for our out of town clientele. 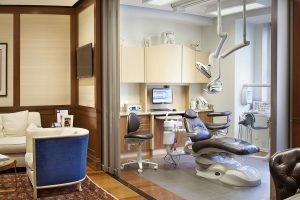 With a private seating area, restroom, kitchen, and state-of-the-art dental operatory, you and your company will feel at home as you are pampered like you are in one of New York’s finest hotels! Porcelain Veneers from start to finish in two days. PearlinBrite laser tooth whitening in only one sitting, with dramatic results. Complex bonding in one visit. A Multilingual staff fluent in English, Spanish, French, Russian, Tagalog, and Arabic, for your convenience. We are located in The Helmsley Building at the heart of midtown Manhattan and would be happy to help arrange for nearby hotel accommodations should you require them. Simply call our office at 1-212-682-5180 for more information or visit our Contact Us page.